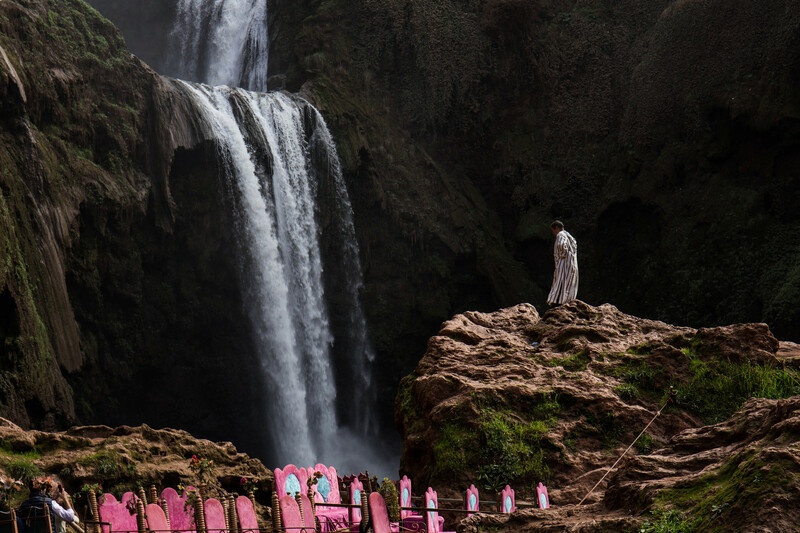 Did you know that Morocco is home to some of the most gorgeous waterfalls in Africa? While the country is known for its desert landscape, there are hidden waterfall gems that are actually easy to find if you know exactly where to look. 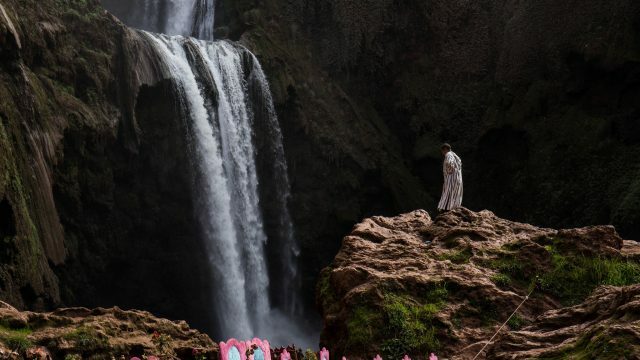 Get ready to snap some Instagram-worthy photos to make your buddies back at home jealous, here are some of the top waterfalls to check out on your next visit to Morocco. The city of Chefchaouen lies far inland in Morocco, but you’ll find plenty of water in its own Talassemtane National Park. There, you’ll find Cascades d’ Akchour with waterfalls spilling out into the canyons, creating a view that’ll stop you dead in your tracks. Guests can hop rocks to explore the gorge and waterfalls. While there, visit the Bridge of God (an unusually tall natural bridge) to get a bird’s eye view of the area. There are two waterfalls in the area, the larger one that’s 100 meters tall and a smaller one at 20 meters. Afterwards, take time to explore the city of Chefchaouen, known for its striking blue buildings throughout the entire city. You’ll find this waterfall in the second largest river in Morocco, the Sebou River. The waterfall is in a small Berber village called Oum er-Rbia near Khenifra and you’ll find houses right on the edge of the gorges. Visitors love to see Cascades of Oum Rbia for its fabulous surroundings that are rich in foliage and towering trees. The waterfalls attract a large number of birds including booted eagles, woodland finches, great woodpeckers, hawks and more. Bring a packed lunch for a picnic on a rock to admire the backdrop of the cascades as you eat. 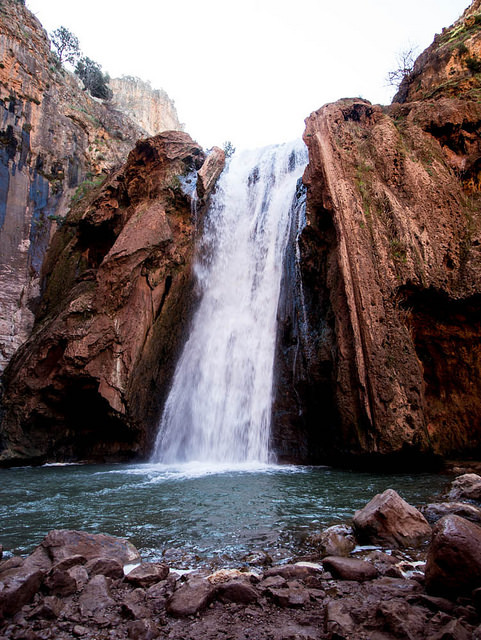 North of Marrakech is the tiny village of Tanaghmeilt, where you’ll find Ouzoud Falls. Visitors love this spot since the cascades show several waterfalls merging into one river that’s shrouded by olive trees. Nearby, there are several mills (some still in use) to process grains. 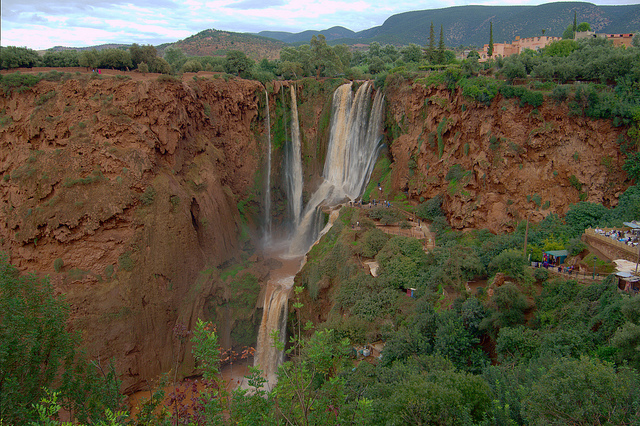 Ouzoud Falls is considered the most popular and picture-worthy waterfall in Morocco. While there, take advantage of the designated hiking trail along the river to get up close and personal. Feel free to visit the village as they’re used to tourists and known for being quite friendly. 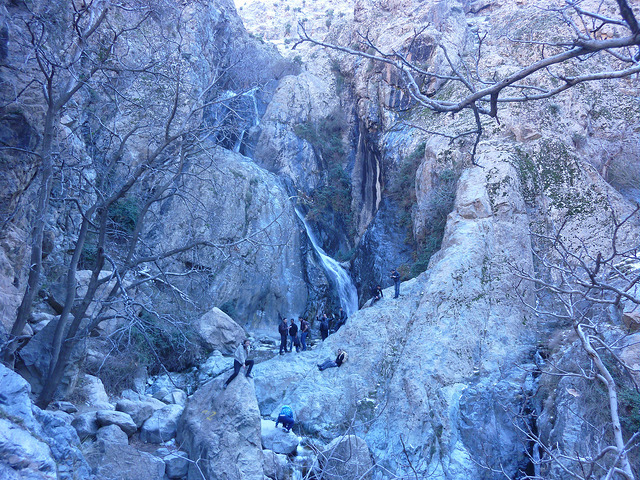 Nearby a popular resort city of Agadir, Paradise Valley is known for its cluster of waterfalls throughout the area. Several of the waterfalls (like the one pictured above) dump into a calm pool that visitors are more than welcome to swim in, and of course, take a spectacular waterfall shower. Word has it that during the 1960s, Paradise Valley was a hangout for musicians, artists and beatniks. Famed celebs like Jimi Hendrix used to dip in the pools and its reputed that he christened the place with the name, Paradise Valley. Plan to stay overnight in one of its designated campsites to extend your waterfall experience. After all, what’s a more relaxing sound than hearing the calming falls in the night time? Right by Marrakech in the foothills of the Atlas Mountains is Ourika Valley that has its own impressive collection of waterfalls. The waterfalls vary in different sizes and visitors can put their hiking and climbing skills to the test by tackling large rocks to make their way to the base of the waterfall. Nearby, there are several vendors selling drinks and souvenirs, giving you a convenient place to hydrate and take home memorabilia. 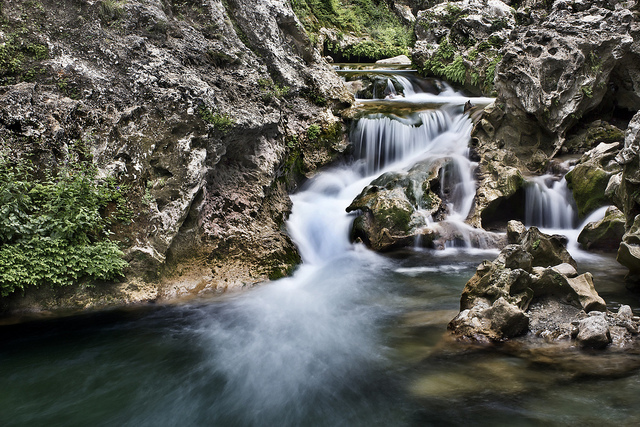 Check out Setti Fatma, the largest waterfall in the area at 30 meters high. For those who wish to have a tour guide, there are several Berber locals lined up at the entrance who are more than happy to lead the way and show you how to climb its steep slopes. There are also large pools that are permitted to swim in and bask in the full splendor of Ourika Valley.